Good morning and welcome to another 48 Hour Flash Sale! This sale is for 48 hours ONLY and will end on Sunday, February 4, 2018, at 7 AM PST. We have an amazing new kit we are showcasing! Happy Rainy Days consists of a stamp set with coordinating dies, along with a coordinating stencil! We are so excited to share this EXCLUSIVE kit with all of you! Now since it is exclusive, once the kits sell out, they are gone forever. 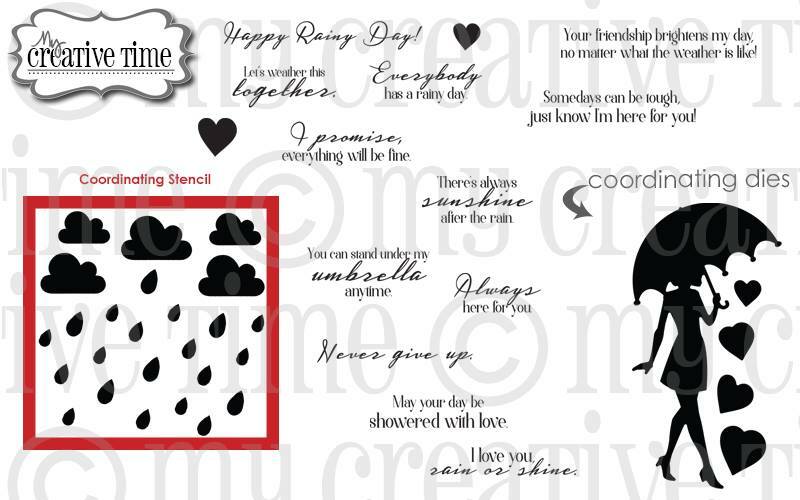 I had so much fun creating a stormy scene on my card today using the stencil from the kit! I started by using a "smooshing technique," smooshing Tim Holtz Distress Ink in Stormy Sky and Broken China on a piece of acetate, spritzing it with water, and then pressing that down onto a piece of Strathmore Bristol Cardstock. After drying that with my heat tool, I used the stencil and the Stormy Sky ink with an ink blending tool to add on the clouds and raindrops. I love how this turned out! To give the card a big pop of color, I ink blended more Strathmore Bristol Cardstock with Picked Raspberry and Wild Honey distress inks and then die cut the cute girl from the kit. I used one of the heart dies with some of the extra inked paper while I was at it. The sentiment, one of 12 fabulous options from the kit, was stamped on a die cut made with one of the Fun Stitched Tag Dies. This is such a fun kit, and we cannot wait for you to see all of the projects the team has created with it! Don't forget to use the code FLASH at checkout to get 20% off your entire in-stock only purchase! Leave your comments on every stop for a chance to win a $25 Gift Card to the "My Creative Time" store! Don't forget to leave a way for us to contact you "just in case" YOU are the LUCKY winner! Good Luck! Your next stop is the very talented Kendra! Miss Katie, I SUPER DUPER LOVE your watercoloring on your card!!!!!! WOW....it's PERFECT! Thank you! I am in awe of the background you created! It is perfect for the stencil to then go on! I also love the pop of color for the figure and accent heart. Love your card! Lovely watercolor and blending in this Katie. This is so cool. I love the background you created!! OMG Miss Katie...WOW what a Magnificent card!! Your Watercolor background is Amazing!! You so achieved the look of a true stormy day...I've never seen this done before. You totally did one incredible creative job & created one Spectacular scene!! YOU so ROCK!! So lovely! I never would have thought of watercoloring then using the stencil! Thanks for the inspiration!! Beautiful job on your smooshing and stencilled background. I love the nice bright colors on the girl die cut and heart. Wonderful job! Beautifully done. Your BG is awesome. Pretty card!! love the background! Very different background. You are very creative. Great card! Love your background! I love this background...looks like a storm is brewing! Love the background you created.